Everyone loses his or her car keys. Stitch markers. Pens, pencils, homework assignments. Small, inconsequential things. Sometimes even large, not-so-inconsequential things—your mind, your faith, your sense of humor. Hopefully, you get them back. I can’t say that I’ve ever lost an entire town, though. In the latest installment for her Sugar Maple series, Barbara Bretton starts off doing just that. Chloe, our magical heroine and yarn shop owner, finishes the battle for the soul of her lover’s daughter against her arch-rival, and ends up losing the entire town of Sugar Maple. What follows is an often humorous, often gut-wrenching trip through the town of Salem, Massachusetts, and the history of Sugar Maple itself, from the founding members through the present population. Bretton manages to make the book fairly ooze with Chloe’s quiet (and sometimes not-so-quiet) desperation at trying to get the soul of her town back and Luke’s frustration at not being able to do more to help the woman he loves and the town he’s growing to love just as much. We get to see Chloe and Luke rummage through the distant past of Salem and Sugar Maple, we get to see them take the forces trying to keep them apart head-on, we get to see parts of both of them that aren’t quite so evident in the first two books. We also get to see a deeper side of Janice, Chloe’s shape-shifting hairdresser and one of her best friends. This book felt a little different to me. It was, by necessity, rooted more in the “real world” than the last two. It was fantastic to see more of the “mundane” world of knitting (the circs vs. DPNs discussion, the top-down vs. toe-up [which, by the way, toe-up is so much better], all of the little knitting references to designers and yarns and fibers) instead of the fantastical world of the town of Sugar Maple. Don’t get me wrong, I love the whole series more than I love my yarn club, but to see another side of Luke made it that much better. There are twists that come about for Luke that should make for an interesting future for Chloe. There were, as usual, many, many times that I laughed out loud during this book, and quite a few times that I got choked up. It’s a good, solid, well-told tale that faithful readers will appreciate and new readers will thoroughly enjoy. 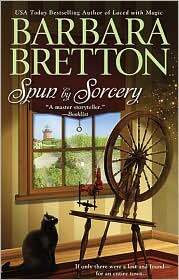 What does Bretton have brewing for the next book in the Sugar Maple line? I have some ideas. Suffice it to say, though, that I’m looking very forward to it.